Art Talk: We're Hopping again! Welcome to The Rubber Cafe/Faber-Castell Design Memory Craft blog hop! If you've just joined us today and would like to start the blog hop from the beginning, simply click on The Rubber Cafe blog to begin. If you've come here from Cherry Nelson's blog, you are in the right place! Here's my project using both company's products! 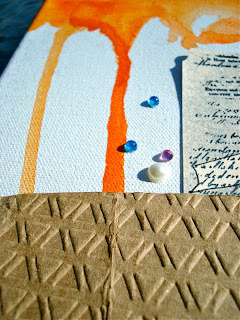 I knew I wanted to create a mixed media canvas for this project. The stamps inspired me to create with wings in mind (aren't they always showing up in my work?). I used a variety of Faber-Castell's products in this project. 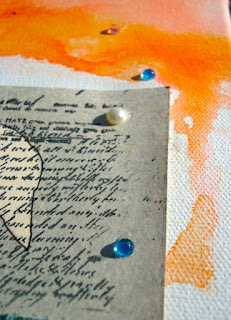 Close up of the Prima canvas page that I colored with Gelatos and stamped with the Big Brush Markers. This is a sneak peek of a new product that DMC is releasing at the Summer CHA. New crayons and watercolors! I used the crayons as a resist with the watercolors over them. 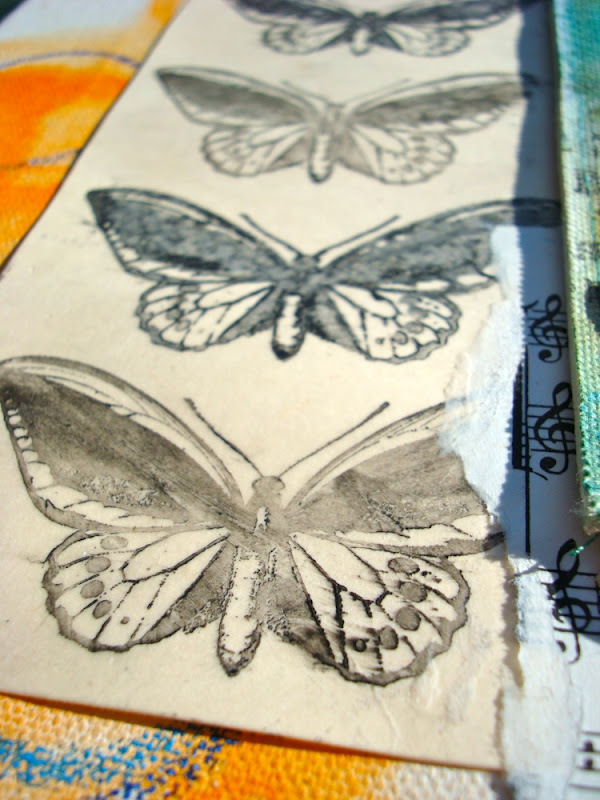 Gelato stamped butterflies! I drew on the stamp with a silver and black Gelato and stamped! Every other one, I misted with water to create a more intense version. 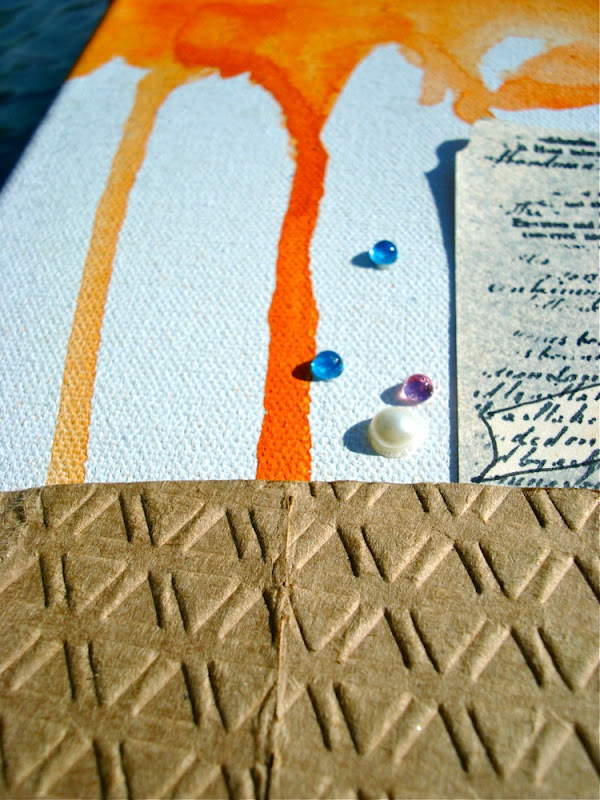 Drippage and Jellie Dots create lots of color and texture from the coffee sleeve. See the birdie? I used my template that I drew (from the Prima tote class) over a stamped file folder. I used the Big Brush Marker and 18th Century Proclamation stamp. I created a mist with black and silver and used it over the template. Once dry, I outlined with a PITT artist pen. I totally enjoyed using The Rubber Cafe's products in making this canvas! For your next stop on the hop, you'll be visiting Melissa http://stamping-queen.blogspot.com. 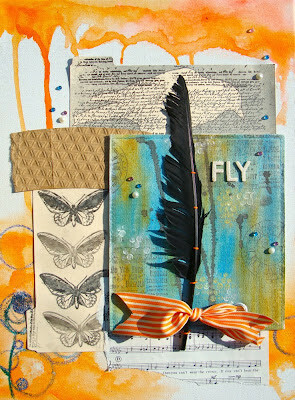 Jennifer Matott http://arttalk-sigmagirl.blogspot.com/ <--------You Are Here! love your canvas. Those are all my favorite colors. Thanks for a chance to win. 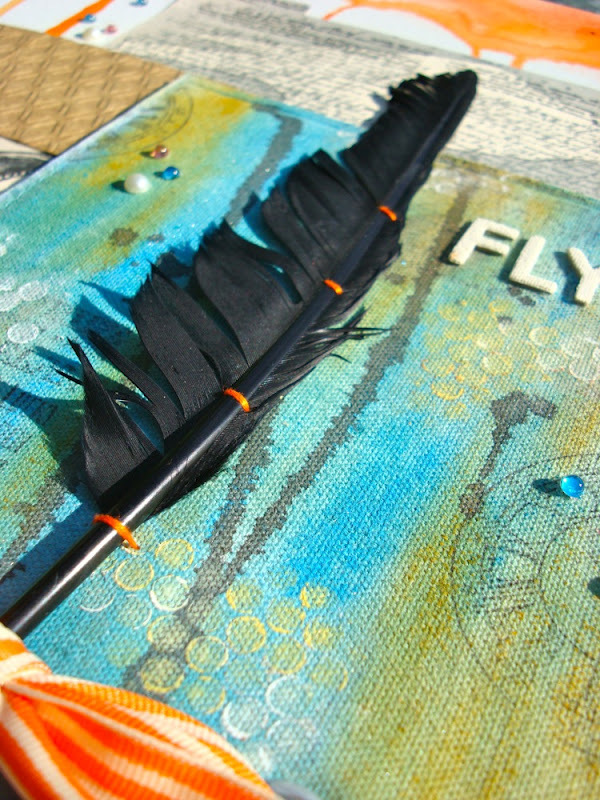 Fabulous canvas--the feather is perfect! Such a neat canvas! 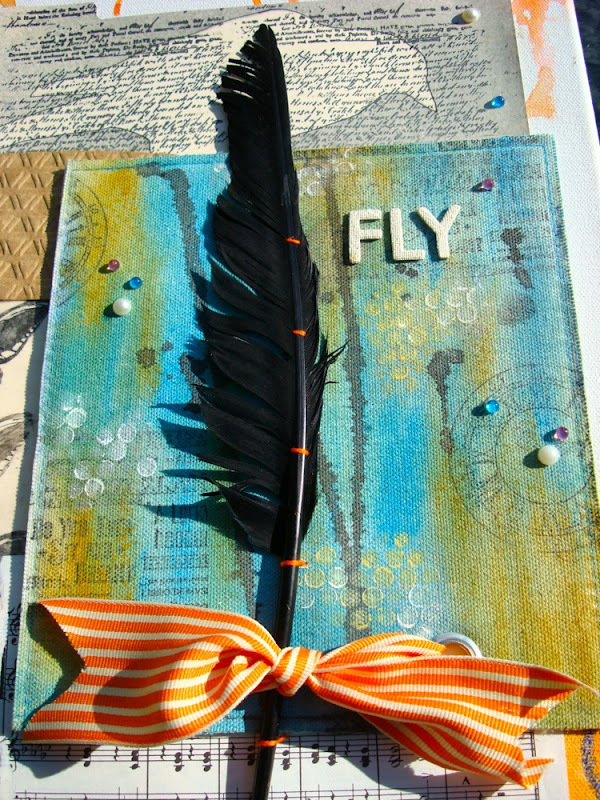 LOVE the feather! Your canvas is so neat!! Hi your canvas is beautiful. I looovvve the background! That orange just sings - Love it! Also intrigued by the crayon-resist and watercolor technique you mention. Looking forward to hearing more about it. Love Love Love your ideas! I love my new gelato! Thank you for your inspiriation! Love how you incorporated the feather. Oh can't wait to see the new products from DMC! Love the spray technique with the mask. Excellent job! fabulous canvas - love the colors & textures! Not usually a fan of orange, but all I can say it WOW!!! You put it to great use! I See the birdie. Wow a lot of work went into this card. How creative. Such neat projects- thanks for sharing different ways you used the gelatos- I just got my first ones and seeing ways to use them is fabulous. Love what you did with the gelatos and the bird just snuck up on me. Great project! The butterflies stamped with the gelatos is my favorite! Love the watercolor effect you got with them! You used many of my favorites: birds, butterflies, teal, handwriting stamps, gelatos...Beautiful! I happen to love mixed media art, so this speak really spoke to me. 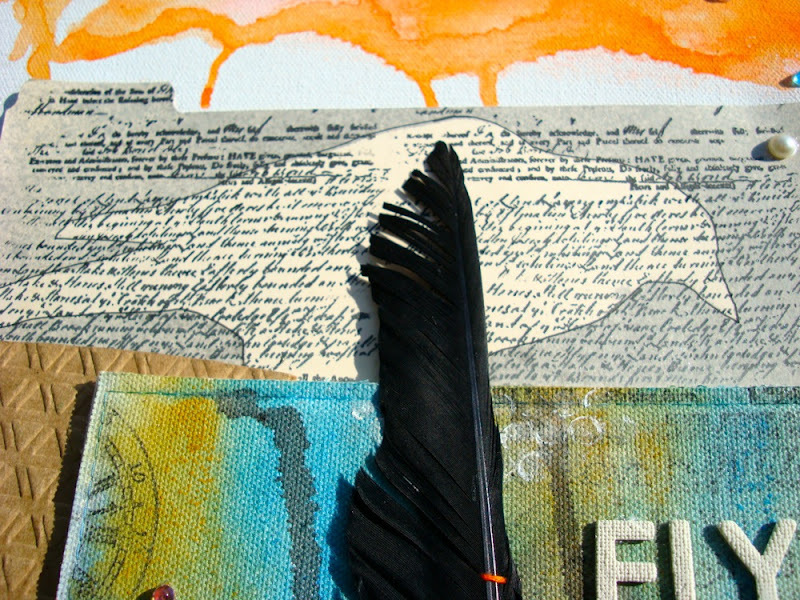 I enjoyed all the elements you incorporated, from the feather to the coffee sleeve. I thought the way you used the gelatos was inspired! 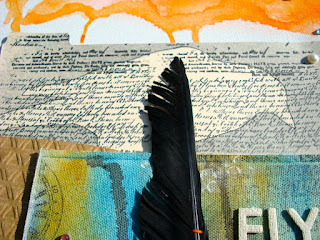 Thanks for being part of the blog hop, I enjoy seeing what everyone creates and getting inspired! I follow your blog via email and GFC! 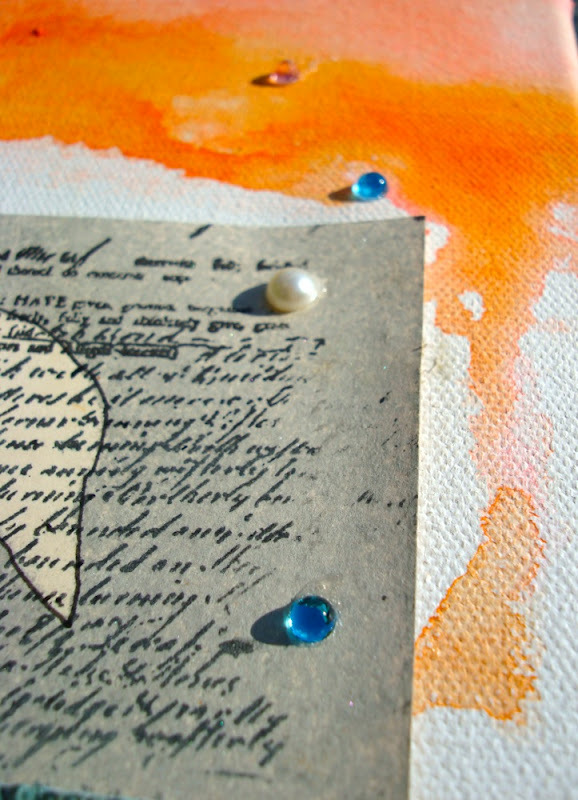 I am new to art journaling and am very excited to have found your blog! I can't wait to try some of your ideas! A piece of art!!! Just beautiful!!! Thanks for sharing. Gosh, I love how you used the gelatos. I really like how you attached the feather too. Jen - Fabulous job as always. Love the color combo. Would have never thought to use the gelatos on the stamps. 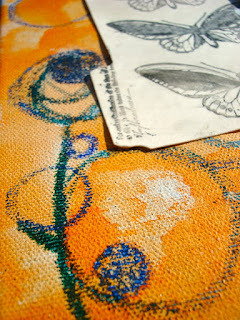 Wonderful canvas design! Love the new products you used. Wow! So many techniques. Wondered about ways to use Faber Castell products. Now I know. Thanks for sharing your talent. IGreat inspiration, I have a canvas, and will get out gelatos to play!! Great canvas. I love all the textures. Thanks for sharing! You've created such a beautiful canvas-love the colors & all of the wonderful details! Fabulous canvas. I just purchased the gelatos and LOVE them! Love the recycled coffee sleeve, and I didn't see the bird until you mentioned it. very artzy, love it. I like your subtle and bold style. Wow what a great canvas! I love the way you used different layers and textures! Awesome! Thanks for sharing. Gorgeous! Love the bright colors and how the black feather stands against the background! I love when a canvas is used. Very cool! wow...so many great details. Very very nice! The bird outline that you did was fabulous. Your layout had so much fine detail.